The global endodontics and orthodontics market was estimated at US$ 3,054.2 million in 2017 and expected to reach US$ 5,077.4 million by 2026, expanding at a CAGR of 5.8% from 2018 to 2026. 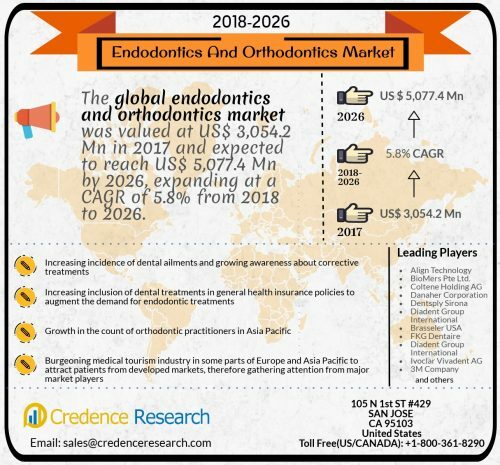 The latest market report published by Credence Research, Inc. “Endodontics and Orthodontics Market - Growth, Future Prospects, Competitive Analysis, 2018 - 2026,” the global endodontics and orthodontics market was valued at US$ 3,054.2 Mn in 2017 and expected to reach US$ 5,077.4 Mn by 2026, expanding at a CAGR of 5.8% from 2018 to 2026. Dental tourism is becoming a prominent healthcare industry in several countries. For instance Hungary is a prominent hub in Europe, whereas several countries in Asia Pacific are attracting patients from developed countries where dental procedures present a significant share of healthcare expenditure. This has also led to several manufacturers of orthodontic and endodontic products to focus their penetration to such emerging markets. The endodontics and orthodontics industry present a fragmented market, with several reporting of consolidation activities and consistent new product introductions. Some of the major players profiled in this report include Align Technology, Inc., BioMers Pte Ltd., Coltene Holding AG, Danaher Corporation (Ormco), Dentsply Sirona, Diadent Group International, Brasseler USA, FKG Dentaire SA, Diadent Group International, Ivoclar Vivadent AG, 3M Company, DENTAURUM Gmbh & Co. KG, Ultradent Products Inc., Henry Schein, Inc. and Patterson Companies, Inc.